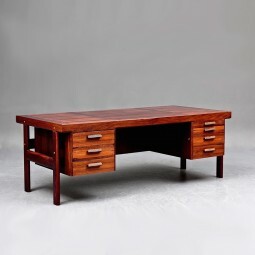 This is a large imposing desk, very well made in the 1960s and thoroughly useful and practical. 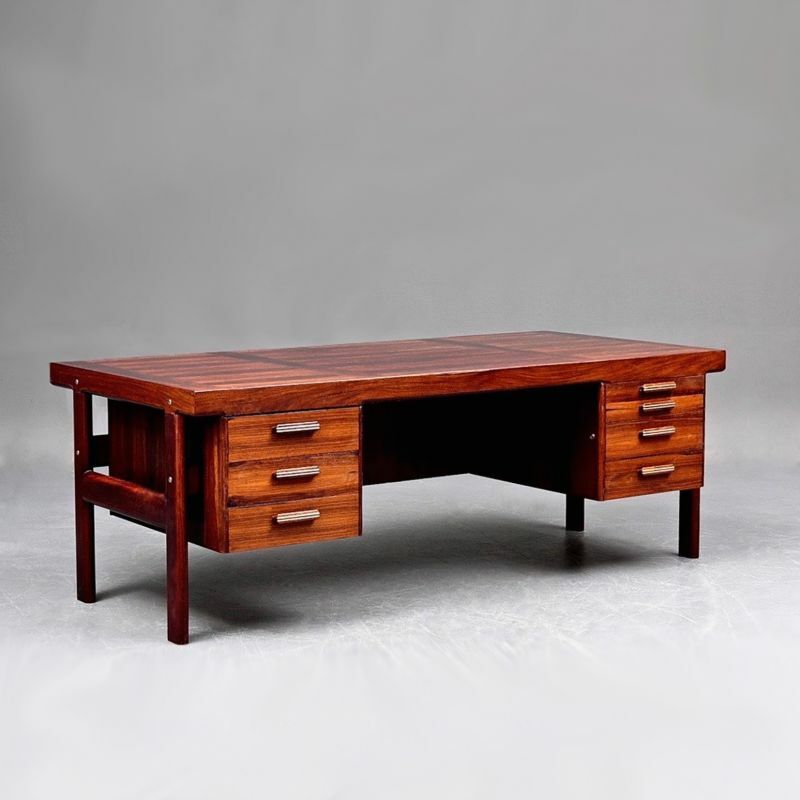 The desk was designed by Arne Vodder, one of the prominent Danish designers of the mid twentieth century. 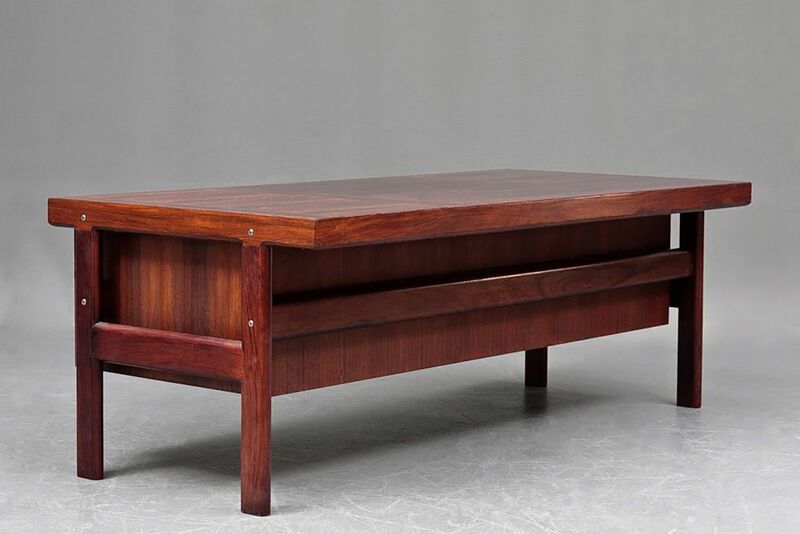 This an extract from a furniture design web site: Danish architect and designer Arne Vodder should be counted among the most influential Scandinavian mid-century designers. A student to famous furniture designer Finn Juhl, Mr Vodder started designing furniture for Fritz Hansen, France & Son and Sibast, the latter for which he designed a wide range of furniture which received worldwide recognition and success. His beautiful designs were nicely detailed and modest in their expression, almost without exception based on natural materials. 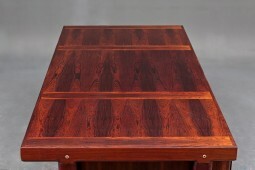 Rosewood and teak - according to the fashion at the time - seem to have been the preferred materials, often combined with colourful panels catching the eye. Today, Vodder is perhaps most appreciated for his beautiful rosewood and teak sideboards designed in the 1950-1960's and produced by Sibast Furniture. 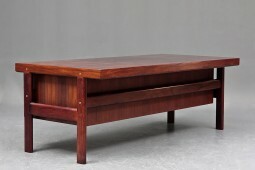 Pieces by Vodder are regularly seen at high-end 20th century design auctions, and rare pieces can reach really high prices. The desk is large and practical with plenty of space to work with a computer. This desk is model 234 and was manufactured by Sibast. The top has a wonderful figured rosewood surface, and the drawer handles feature contrasting strips of aluminium. It is finished on all sides, so can be placed to face the room. There is quite an overhang at the back so a colleague could sit and discuss plans. The desk is in very good condition. The measurements are 200 cm wide, 94 cm deep and 72 cm high.